Like many of my guide colleagues, I found myself interested in the Great War from an early age. Family stories and involvement many years ago in a college production of Oh! What a Lovely War nurtured a growing desire to find out more. I graduated with a BSc in Hotel and Catering Management and my career took me through a variety of jobs within the hospitality industry before I opted to follow my overwhelming interest in the Great War. For some, this interest is based on the strategy and tactics, for others it is a sense of place. 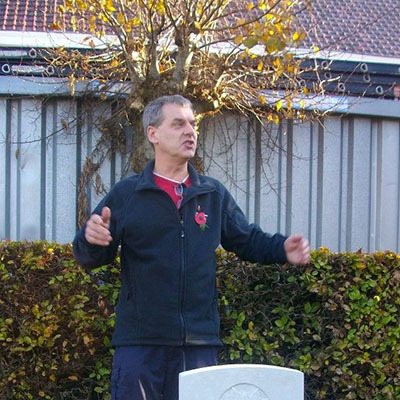 As a guide, it is all those things and more and what I find most rewarding is the connections that people are able to make and take away with them from a trip to the battlefields. Often these involve the completion of a part of personal quest. This may sound melodramatic, but to be in the spot where loved ones fought or fell can bring quite an overpowering sense of purpose and place, and it is these experiences that help to make us who we are and find that connection with where we have come from. 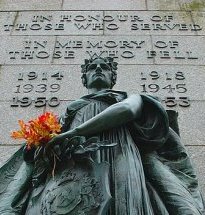 In essence, my personal view with regard to any battlefield is to remember and respect those who fought. Any reading or research done prior to a visit will only be enhanced by the connections that are made once upon the ground.